Enya: I thought it was quite an exciting challenge to try and capture what I’m hoping would be seen as 21st century Christmas carols. And I work very closely with Roma on one of the pieces ‘White is in the winter night’. It’s very descriptive. It’s white is in the winter night, red is in the holly, green is in the mistletoe. And we wanted to be able to feel that everybody would want to join in. Roma Ryan: ‘White is in the Winter Night’ is sort of song I personally want to sing and I want to sing it with others. 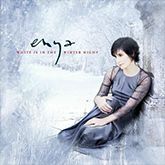 ‘White is in the winter night’ was released as a download-only single on November 4, 2008. Physical promotional copies were distributed in the US and Europe.